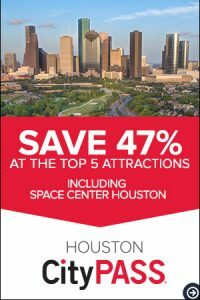 Space Center Houston showcases the artistic side of space exploration, displaying some of the most famous artists of the 20th century in a new exhibit open now through Jan. 6. To help celebrate NASA’s 60th anniversary on Oct. 1, we are preparing a display of more than 25 works of art, including paintings, photography, poetry and musical compositions. The pieces were selected from NASA’s art program and from the International Association of Astronomical Artists. The artwork on display include pieces by artists including Andy Warhol, Annie Leibovitz, William Wegman, Robert Rauschenberg, and Jamie Wyeth. The temporary exhibit will be on display Sept. 27-Jan. 7, 2019 in Astronaut Gallery. It is included in general admission. In the 1970s, U.S.-Soviet political tensions that had accelerated the space race began to thaw. Competition gave way to cooperation between the two nations with the Apollo-Soyuz Test Project. International collaboration among many nations became the norm during the Space Shuttle era and continues through current cooperation in human spaceflight with the International Space Station. The first “A” in NASA dates to the agency’s origins. When the National Aeronautics and Space Administration was established in 1958, it was a revamped National Advisory Committee on Aeronautics (NACA). Since then, NASA has played a significant role in the development of aircraft, improving efficiency and safety, increasing speed and reaching new heights. For decades NASA has sent uncrewed probes into the solar system to learn about other planets and see beyond them. Warhol transformed the most iconic image of the first Moon landing, Buzz Aldrin on the Lunar surface, into the greater frenetic atmosphere of the 1960s. By adding neon pink and orange to the astronaut spacesuit, Warhol charged the image with cultural context beyond the pragmatic image of the space program. Andy Warhol was a leading figure in the visual art movement of pop art. His works explore the relationship between artistic expression, celebrity culture, and advertising. 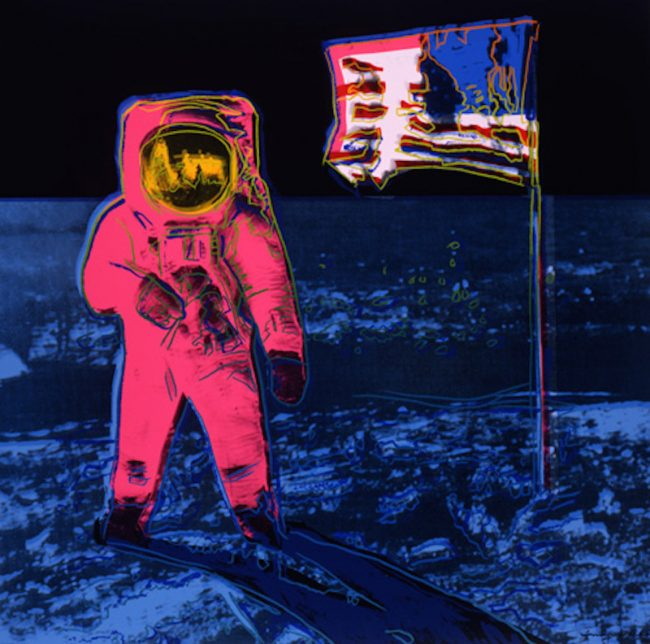 Warhol combined official NASA images AS11-40-5875 and AS11-40-5903 and added some artistic interpretation. He used the famous “selfie” that Armstrong took of himself using the visor of Aldrin’s spacesuit as a mirror. Warhol mirror-reversed image; notice in the photo the astronaut is bending his left arm, but Warhol’s astronaut is bending his right. The YF-12 Blackbird was an experimental fighter-interceptor version of the Lockheed A-12 reconnaissance aircraft and the precursor to the SR-71 Blackbird reconnaissance plane. The YF-12 allowed NASA researchers at the agency’s four aeronautical centers (Langley, Lewis (now Glenn), Ames and the Dryden Flight Research Center (now Armstrong)) to study the thermal, structural, and aerodynamic effects of sustained, high-altitude flight at speeds greater than Mach 1, the speed of sound. Ren Wicks was an all-around artist with a career that included postage stamps and advertising. He is best known for renderings of aircraft and women. During World War II, Ren Wicks worked for Lockheed, contributing artwork for fighters and bombers that was used in ad campaigns and in pilot handbooks. Wicks is well-known for magazine illustrations and ad work. The F-100 Super Sabre, sometimes referred to as the “Hun,” a shortened version of “one hundred,” was used for a range of NASA airborne simulation studies. Before NASA, NACA flew an F-100 Super Sabre to investigate stability and control features of the then-new supersonic Air Force fighter. Machat captured this JF-100C (53-1709) Super Sabre flying “over the top of clouds” in visual flight, rather than with instruments. This type of flight is usually done briefly to avoid weather or turbulence. An award-winning artist, Mike Machat has captured on canvas the significant flights of many legendary combat and test pilots as they flew into history. Machat has depicted dramatic aviation moments, as well as scenes that would have been difficult or impossible to photograph. The first crewed Gemini flight, Gemini III, lifted off Launch Pad 19 at 9:24 a.m. EST on March 23, 1965. The spacecraft carried astronauts Gus Grissom and John Young, pilot, on three orbits of Earth. McMahon documented the significant first orbit in NASA’s Mission Control. In the 1960s and 1970s, McMahon returned frequently to Mission Control, including for his coverage of Neil Armstrong’s walk on the Moon. McMahon covered momentous events in the civil rights struggle, spacecraft launches, national political conventions and the Vatican, turning out line drawings for major magazines and newspapers. McMahon’s on-the-spot drawings were generally done with a charcoal pencil, and afterward colored using acrylic watercolors in his home studio. In Wyeth’s careful and intense style, launch towers stand along the coastline of Cape Canaveral. Wyeth, who lived and worked on an island in Maine and often painted nature, was captivated by the cutting-edge technology surrounded by Florida’s subtropical landscape. Typical of his thorough research for his realistic approach, Jamie Wyeth visited Kennedy Space Center and other launch sites to talk with astronauts or to ride a rescue helicopter to observe the pickup of astronauts after splashdown for the Gemini and Apollo Programs. Since his youth, Jamie Wyeth attracted considerable attention as a third-generation American artist. He is the son of Andrew Wyeth, among the country’s most popular painters, and grandson of Newell Convers Wyeth, famous for his distinctive illustrations of classic novels. Launch crews worked through the night to prepare the spacecraft and its booster rocket for the Apollo 17 flight. Using a battery-powered lamp, Peter Hurd painted this night view from a field just outside the launch pad at Kennedy Space Center, Florida. Hurd was an apprentice to painter N.C. Wyeth and was well-known for his landscapes and portraits, including a portrait of President Lyndon B. Johnson, which now hangs in the National Portrait Gallery in Washington D.C. Hurd also painted a mural in Holden Hall at Texas Tech University. 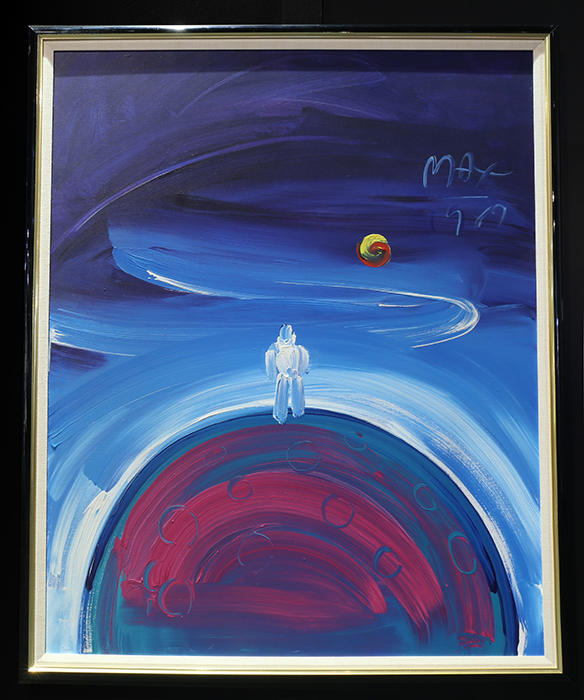 Peter Max released from his personal archives this special painting of the Moon landing for a National Air and Space Museum poster. It depicts a lone astronaut standing on the crescent of the Moon with Earth in the far off distance. This work is done in a painterly style in colors more muted than much of his typical work. For more than five decades, Max has produced uniquely expressionistic and colorful takes on subjects as varied as the Super Bowl, John Glenn, and Taylor Swift. He is known for his boldly colored psychedelic paintings which often feature cosmic themes. Among Fjeld’s best-appreciated artworks are his legendary Apollo-Soyuz Test Project concept paintings, where he depicted the main stages of the Apollo-Soyuz Test Project mission, the Apollo and Soyuz rendezvous and docking. Combining science and art, Hurd based his work on the actual transcripts of missions. One of the best known aerospace artists of our time, Fjeld is an illustrator, writer, space expert, and official NASA and U.S. Air Force artist. The HL-10 lifting body (wingless aircraft) was built by Northrop and was part of a NASA program to study wingless vehicles use for reentry into Earth’s atmosphere for aerodynamic stability and maneuverability from supersonic to subsonic speeds and for landing as a conventional aircraft. Among all the various lifting bodies, the HL-10 holds both speed and altitude records. There were 144 test flights conducted between 1966 and 1975. 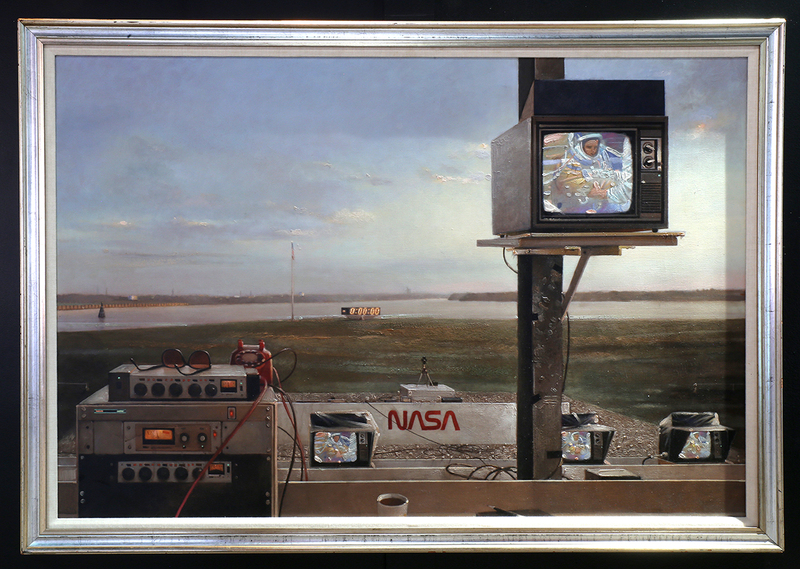 Since the mid-1980s, NASA has commissioned Stokes to paint works ranging from the Space Shuttles to experimental aircraft. Attention to the smallest detail results in the photorealistic style he uses to portray aviation and space, automotive and nautical paintings, landscapes and portraits. Fields of flowers grow around launch complex 39E at Kennedy Space Center in Florida where the Space Shuttle Columbia was ready for flight in June 1982. Kennedy Space Center sits on a wildlife refuge inhabited by bald eagles, manatees, and alligators. James Dean paints realistic watercolors of the American scene – from landscapes to space launches. He was the first director of the NASA Art Program. “Photographs show us how human eyes see a space launch, but it takes an artist to show us the different ways the mind sees, feels and reacts to such an event,” Dean said. 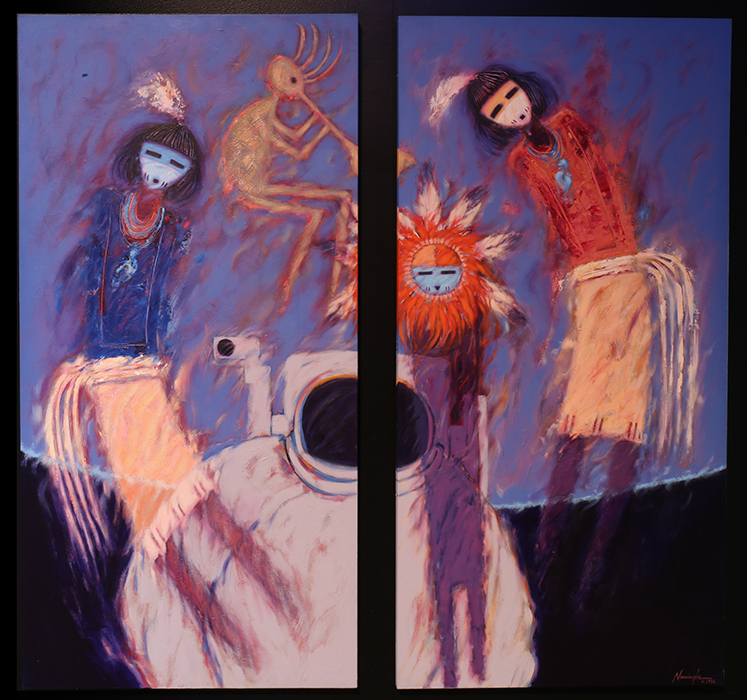 In this painting, Namingha combines his Hopi spiritualism with space technology. An astronaut in free flight is protected by twin warrior guards floating on either side, protecting humans, land, and water. The sun spirit to the right-center represents light, warmth, and light. The humpback flute player symbolizes fertility and strength of plant life and nature, alluding to the beauty of Earth floating in the background. 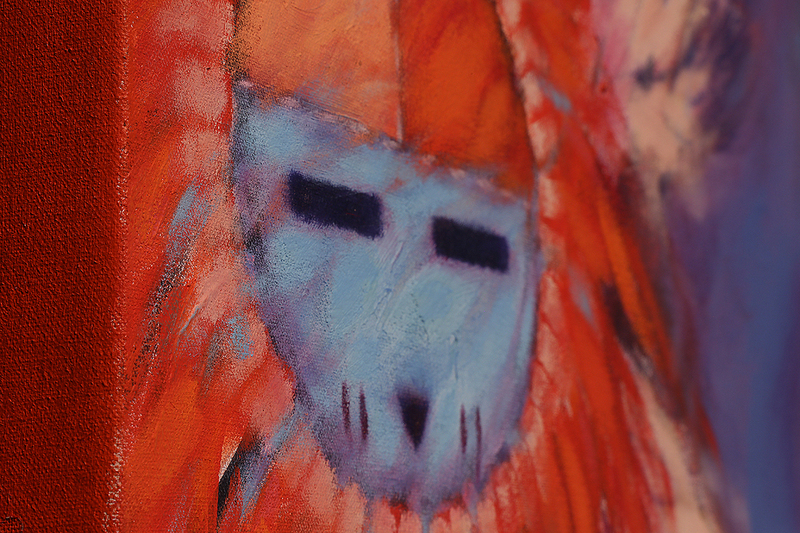 Drawing and painting was a natural part of Namingha’s Hopi childhood. His art expresses his strong feelings about his culture and environment, leading to a path of creative freedom. Rauschenberg attended the first launch of the Space Shuttle Columbia in April 1981. This lithograph exemplifies his art of inclusion by capturing elements of the Space Shuttle, Kennedy Space Center and the space culture of the Cocoa Beach community around Kennedy Space Center. A native of Port Arthur, Texas, Rauschenberg challenged the status quo in art with “Combines,” which included non-traditional materials and objects in innovative combinations in paintings and sculpture. Astronaut John Young reflects pensively as he suits up for launch on April 12, 1981. Caselli conveys a quiet, almost spiritual moment when the astronaut must mentally prepare for his mission. This was the first time that the newly inaugurated space shuttle would carry humans, in this case the two-person crew of John Young and Robert Crippen. Casselli served in the Marine Corps as a combat artist. After his return from the Vietnam War, Casselli chose watercolor as his medium to reconnect with his native city of New Orleans, particularly focusing his attention on the life of African Americans. Hoffman captures astronaut suit-up in an original way through the televisions in the press site bleachers at the Kennedy Space Center on launch day. The countdown clock awaits and the launch pad can be seen in the distance. It is a calm moment before the frenzy of launch activity. Throughout his career, Hoffman’s style ranged from energetic abstraction and hard-edge pop to photo-based realism and minimalism. His versatile paintings and illustrations were shown nationally and internationally. The Mir missions represented a renewed friendship between the United States and Russia. Sorrells-Adewale depicts the historic Mir docking mission with a sense of celebration, world friendship, and common goodwill. Sorrells-Adewale’s work embraces abstraction. His travels to West Africa, China, Italy, Brazil, Mexico and Trinidad, coupled with readings on the symbolic and the metaphysical, has inspired his use of materials, form, color and texture. Wegmans Weimaraners pose as astronauts. One peers out of the space station while the other conducts a spacewalk. NASA lent Wegman a model of a spacesuit to use in this work. Wegman’s dogs are central figures in some of his best-known photographs and videos. 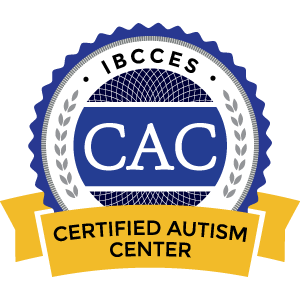 His work has appeared in books, advertisements, films, as well as on television programs like Sesame Street and Saturday Night Live. Wegman’s art, which also includes painting and drawing, is recognized in permanent collections of the Museum of Modern Art, the Smithsonian American Art Museum, and other national and international art museums. Leibovitz photographed Eileen Collins at the Johnson Space Center here in Houston during training for the STS-93 mission in 1999. Collins was the first female pilot and the first female commander of a Space Shuttle mission. She flew four missions in all before retiring from NASA in 2006. Annie Leibovitz is considered one of the greatest portrait photographers, having captured images of some of the most influential figures of her time for commercial and editorial assignments. Trademarks of Leibovitz’s style are bold contrasts and dramatic poses. Space Shuttle Endeavor landed on May 16, 1992, at Dryden Flight Research Center (now Armstrong) in Edwards, California, where Greene witnessed landing operations. The painting depicts convoy teams servicing the orbiter upon return, including the ground crew hooking up coolant lines (left) and purge lines (right). Greene’s NASA paintings convey scenes in all their detail, and also communicate the scale, intensity and wonder of humanity’s heroic attempts to probe the heavens. Greene’s contemporary style has a strong foundation in classical art. Pond juxtaposes reality with science fiction as the Space Shuttle Enterprise approaches the fictional Starship Enterprise from Star Trek. Pond’s work features bright, cheerful colors and balanced compositions. Deviating from the expected and rejecting the conventional, his particular use of color offers the viewer a charming, idiosyncratic interpretation of the world. Technicians work on the Hubble Space Telescope from various platform levels. A contrast is evident between the human scale of technicians and the giant space telescope. His skill for depicting the likenesses of actors made Solie a celebrated movie poster artist who created more than 200 posters. He was also a talented sculptor and illustrator. His sculpture of Walter Cronkite is on display in the lobby of the CBS building in New York. York trained in NASA’s virtual reality lab to produce this work. A large circle on a stylized circuit board features a square module interior and a landscape seen through a rectangular window. 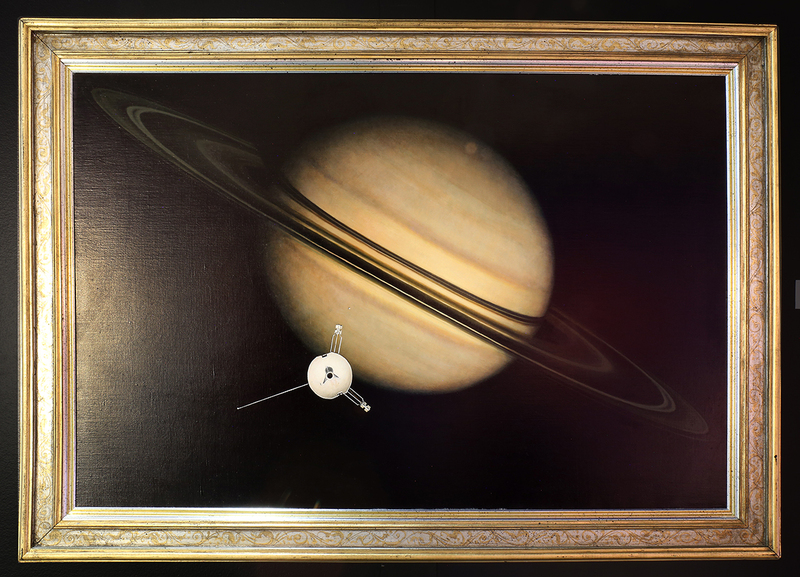 York worked with original photos of planets, then made a painting of the virtual reality computer images. John Glenn was the first American to orbit the Earth. He was given a hero’s welcome during a ticker tape parade in New York City. Rosenberg is a painter, printmaker, art patron, lawyer and playwright. Most of his paintings are representational while others are semi abstract. Rosenberg’s colors and brush strokes show the influence of Vincent Van Gogh and the Impressionists. On September 1, NASA’s Pioneer 11 came within 13,000 miles of Saturn, making it the first spacecraft ever to sweep closely past that planet. The spacecraft found a new ring for Saturn – now called the “F” ring – and also a new Moon. Pioneer 11 is still sailing away from Earth, even though its transmissions stopped several years ago. As far as scientists know, it’s off toward the center of our Milky Way galaxy, generally in the direction of our constellation Sagittarius. A modern landscape painter, Hurley’s worldview was shaped by a strong sense of history and his time as a pilot. He was interested in how art changed with changes in technology and perception. Prey chose watercolor for this rendering of the International Space Station before its construction was completed. Watercolor lends itself to fragility, freshness, drenched colors and speed. This work was the first of four NASA commissions for Prey. For this and her other paintings Prey visited NASA centers and did extensive research. Exemplifying the grid method, the background of this quilt is made up of individual squares, which were pieced together representing the pixelated data in which deep space images are transmitted. Applique pieces are fused to the background creating undulating lines and movement that soften the composition. Multicolored threads in various stitch lengths express the dynamic energy of birth through color and form. A lifelong fan of space and the space program, Hart is working on a series of deep space art quilts using images from NASA’s Hubble telescope as the inspiration. She portrays nebulae and galaxies, and integrates digital work into some of her works. Burns wrote the poem as a dialogue between herself (a space artist and amateur astronomer) and the planet Mars. The military language alludes to the Roman god of war for whom the planet was named. The past, present, and on-going exploration of Mars by NASA and international space agencies are akin to military maneuvers. The culmination of the dialogue makes the point that success (or victory) is subjective and always comes at a cost. Burns is a Fellow member, and former European Vice President, of the International Association of Astronomical Artists. In addition to poetry she creates visual art, working with acrylics on canvas, digital media, and torch-worked glass. Space Dust expresses Taylor’s interpretation of “outer space.” To represent the vastness of space, Taylor broke up clear-backed dichronic glass fused into white glass and spread it across a black disk. With a background in space policy and space science, Taylor seeks to express space in her creations of infused glass. She experiments, pushing the limits of the medium. This symphony celebrates the past, present, and future exploration of the solar system’s moons. Australian born composer Amanda Lee Falkenberg established a relationship with music at an early age. Recent achievements include 2017 and 2016 winner of the Great American Song Contest in the instrumental category. New Horizons is an interplanetary space probe that was launched in 2006 with the primary mission to perform a flyby study of the Pluto system in 2015, and a secondary mission to fly by and study one or more other Kuiper belt objects in the decade to follow. The Crew Exploration Vehicle (CEV) was the conceptual spacecraft that later became known as the Orion spacecraft. The Orion CEV was part of NASA’s Constellation Program to send human explorers back to the Moon, and then onward to Mars and other destinations in the solar system. Spadoni, President of Aerospace Imagineering, is an MIT graduate with extensive experience as an aerospace engineer, conceptual designer, and futurist. He has contributed to the conceptual, prototype, and production design of advanced aircraft, missiles, and spacecraft for NASA, DARPA and the military. He is a Fellow of the International Association of Astronomical Artists and is currently serving on its Board of Trustees. Space Shuttle Challenger launch carrying Spacelab 2 into orbit.